Despite all the care in operation and maintenance, engineers often face the statement “the pump has failed i.e. it can no longer be kept in service”. Inability to deliver the desired flow and head is just one of the most common conditions for taking a pump out of service. There are other many conditions in which a pump, despite suffering no loss in flow or head, is considered to have failed and has to be pulled out of service as soon as possible. These include seal related problems (leakages, loss of flushing, cooling, quenching systems, etc), pump and motor bearings related problems (loss of lubrication, cooling, contamination of oil, abnormal noise, etc), leakages from pump casing, very high noise and vibration levels, or driver (motor or turbine) related problems. The list of pump failure conditions mentioned above is neither exhaustive nor are the conditions mutually exclusive. Often the root causes of failure are the same but the symptoms are different. A little care when first symptoms of a problem appear can save the pumps from permanent failures. Thus the most important task in such situations is to find out whether the pump has failed mechanically or if there is some process deficiency, or both. Many times when the pumps are sent to the workshop, the maintenance people do not find anything wrong on disassembling it. Thus the decision to pull a pump out of service for maintenance / repair should be made after a detailed analysis of the symptoms and root causes of the pump failure. Also, in case of any mechanical failure or physical damage of pump internals, the operating engineer should be able to relate the failure to the process unit’s operating problems. Any operating engineer, who typically has a chemical engineering background and who desires to protect his pumps from frequent failures must develop not only a good understanding of the process but also thorough knowledge of the mechanics of the pump. Effective troubleshooting requires an ability to observe changes in performance over time, and in the event of a failure, the capacity to thoroughly investigate the cause of the failure and take measures to prevent the problem from re-occurring. 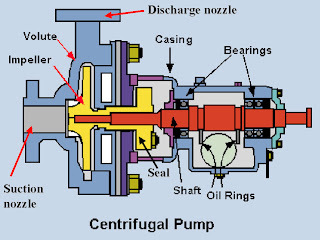 The present article is being presented in three parts, covering all aspects of operation, maintenance, and troubleshooting of centrifugal pumps. The article has been written keeping in mind the level and interests of students and the beginners in operation. Any comments or queries are most welcome. A centrifugal pump is one of the simplest pieces of equipment in any process plant. 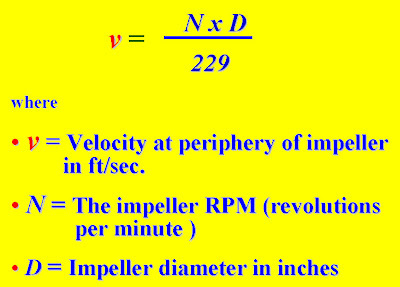 Its purpose is to convert energy of a prime mover (a electric motor or turbine) first into velocity or kinetic energy and then into pressure energy of a fluid that is being pumped. The energy changes occur by virtue of two main parts of the pump, the impeller and the volute or diffuser. 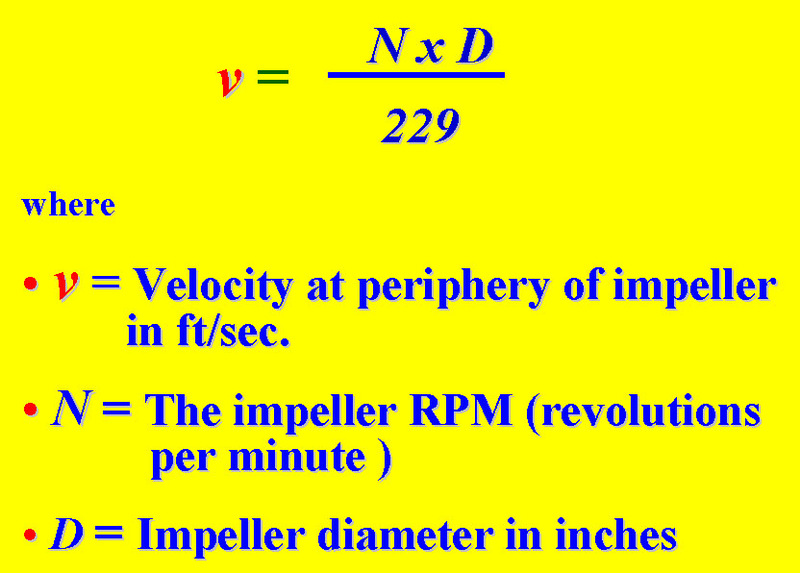 The impeller is the rotating part that converts driver energy into the kinetic energy. The volute or diffuser is the stationary part that converts the kinetic energy into pressure energy. 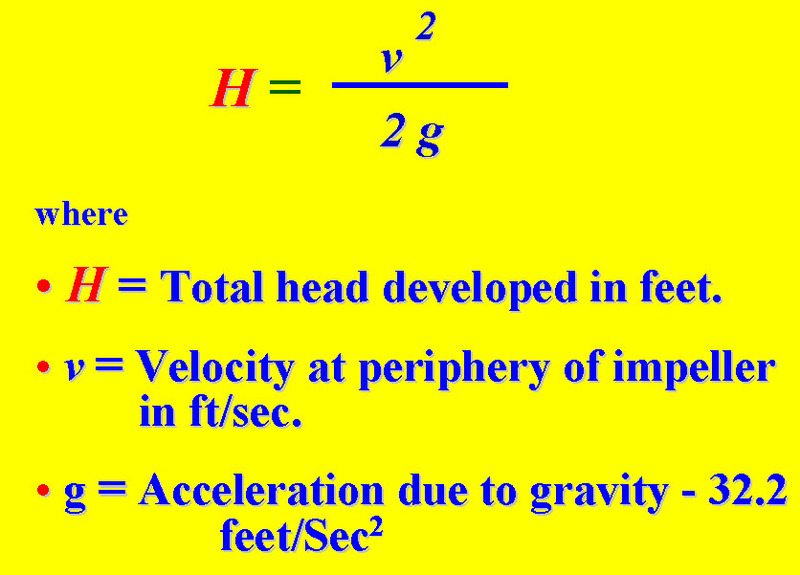 Note: All of the forms of energy involved in a liquid flow system are expressed in terms of feet of liquid i.e. head. 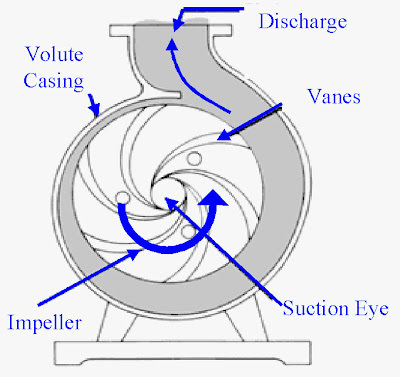 The process liquid enters the suction nozzle and then into eye (center) of a revolving device known as an impeller. 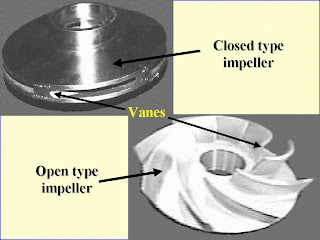 When the impeller rotates, it spins the liquid sitting in the cavities between the vanes outward and provides centrifugal acceleration. 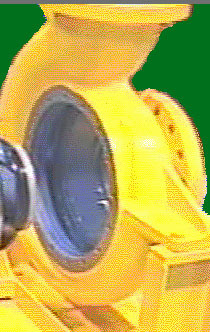 As liquid leaves the eye of the impeller a low-pressure area is created causing more liquid to flow toward the inlet. Because the impeller blades are curved, the fluid is pushed in a tangential and radial direction by the centrifugal force. This force acting inside the pump is the same one that keeps water inside a bucket that is rotating at the end of a string. Figure A.01 below depicts a side cross-section of a centrifugal pump indicating the movement of the liquid. This kinetic energy of a liquid coming out of an impeller is harnessed by creating a resistance to the flow. The first resistance is created by the pump volute (casing) that catches the liquid and slows it down. 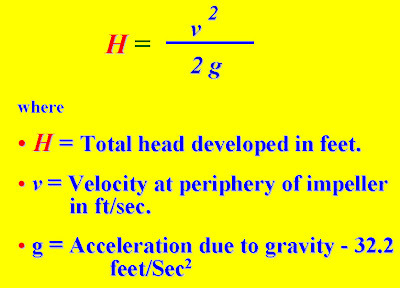 In the discharge nozzle, the liquid further decelerates and its velocity is converted to pressure according to Bernoulli’s principle. II. A stationary component comprised of a casing, casing cover, and bearings. The general components, both stationary and rotary, are depicted in Figure B.01. The main components are discussed in brief below. 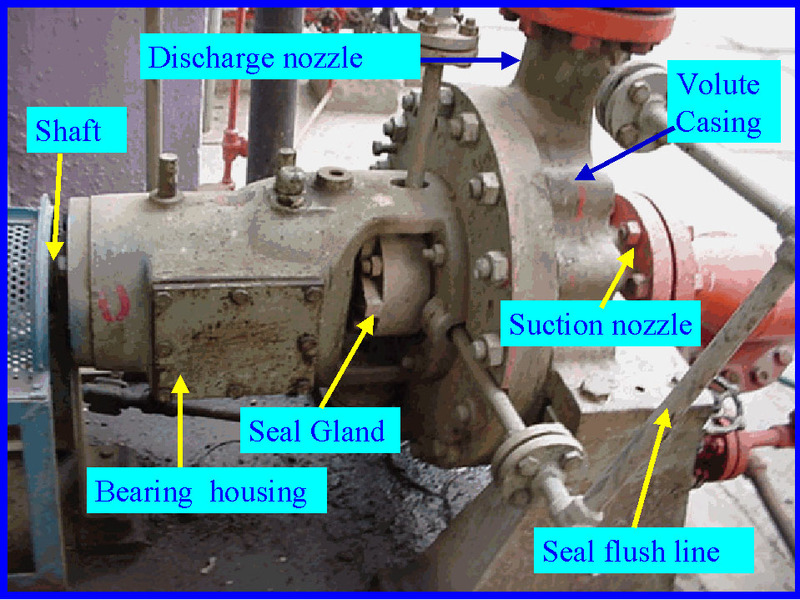 Figure B.02 shows these parts on a photograph of a pump in the field. 1. Volute casings build a higher head; circular casings are used for low head and high capacity. o A volute is a curved funnel increasing in area to the discharge port as shown in Figure B.03. As the area of the cross-section increases, the volute reduces the speed of the liquid and increases the pressure of the liquid. o One of the main purposes of a volute casing is to help balance the hydraulic pressure on the shaft of the pump. However, this occurs best at the manufacturer's recommended capacity. 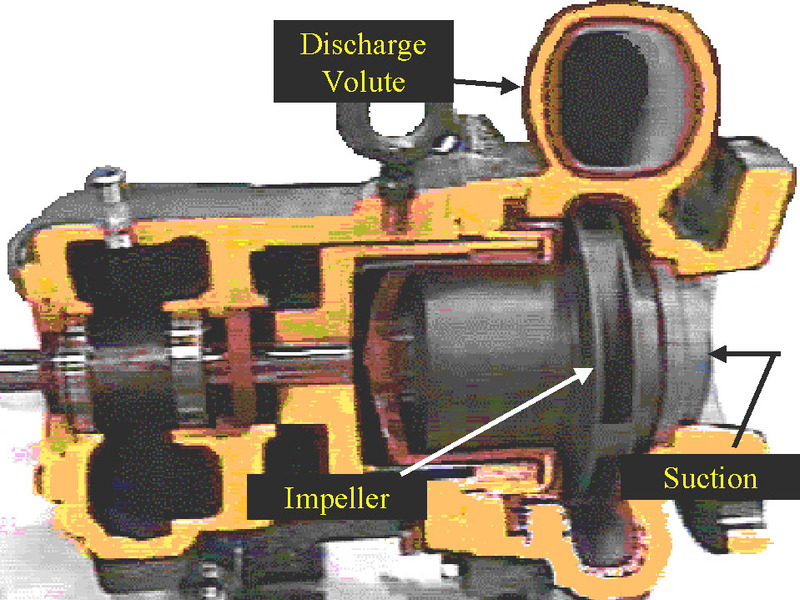 Running volute-style pumps at a lower capacity than the manufacturer recommends can put lateral stress on the shaft of the pump, increasing wear-and-tear on the seals and bearings, and on the shaft itself. Double- volute casings are used when the radial thrusts become significant at reduced capacities. 2. Circular casing have stationary diffusion vanes surrounding the impeller periphery that convert velocity energy to pressure energy. Conventionally, the diffusers are applied to multi-stage pumps. o The casings can be designed either as solid casings or split casings. Solid casing implies a design in which the entire casing including the discharge nozzle is all contained in one casting or fabricated piece. A split casing implies two or more parts are fastened together. When the casing parts are divided by horizontal plane, the casing is described as horizontally split or axially split casing. When the split is in a vertical plane perpendicular to the rotation axis, the casing is described as vertically split or radially split casing. Casing Wear rings act as the seal between the casing and the impeller. The suction and discharge nozzles are part of the casings itself. They commonly have the following configurations. 1. 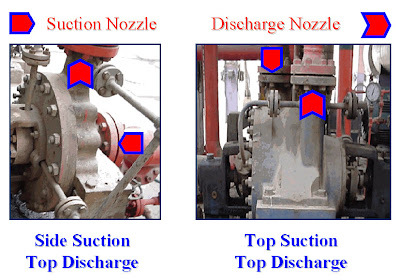 End suction/Top discharge (Figure B.05) - The suction nozzle is located at the end of, and concentric to, the shaft while the discharge nozzle is located at the top of the case perpendicular to the shaft. This pump is always of an overhung type and typically has lower NPSHr because the liquid feeds directly into the impeller eye. 2. Top suction Top discharge nozzle (Figure B.05) -The suction and discharge nozzles are located at the top of the case perpendicular to the shaft. This pump can either be an overhung type or between-bearing type but is always a radially split case pump. 3. Side suction / Side discharge nozzles - The suction and discharge nozzles are located at the sides of the case perpendicular to the shaft. This pump can have either an axially or radially split case type. 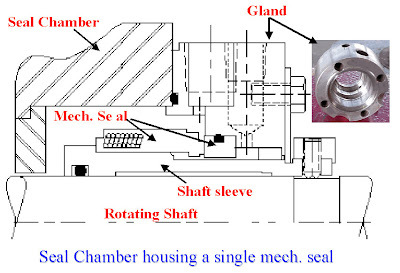 Seal chamber and Stuffing box both refer to a chamber, either integral with or separate from the pump case housing that forms the region between the shaft and casing where sealing media are installed. 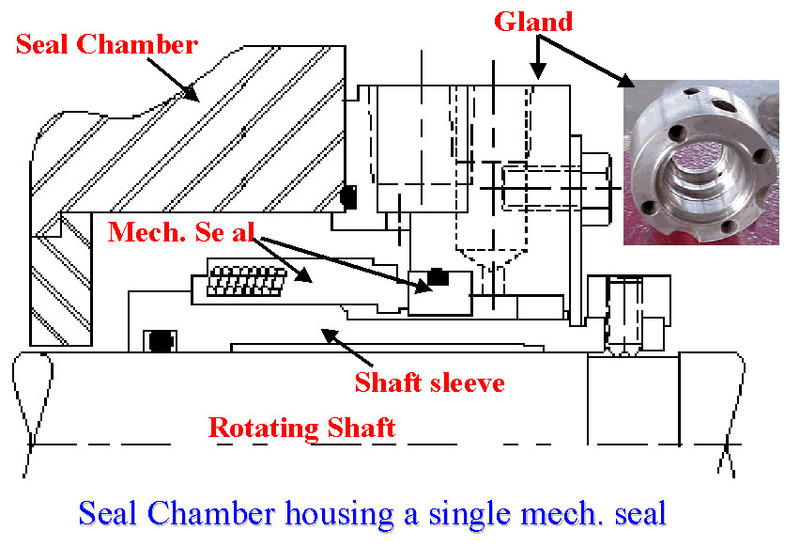 When the sealing is achieved by means of a mechanical seal, the chamber is commonly referred to as a Seal Chamber. When the sealing is achieved by means of packing, the chamber is referred to as a Stuffing Box. Both the seal chamber and the stuffing box have the primary function of protecting the pump against leakage at the point where the shaft passes out through the pump pressure casing. When the pressure at the bottom of the chamber is below atmospheric, it prevents air leakage into the pump. When the pressure is above atmospheric, the chambers prevent liquid leakage out of the pump. The seal chambers and stuffing boxes are also provided with cooling or heating arrangement for proper temperature control. Figure B.06 below depicts an externally mounted seal chamber and its parts. o Gland: The gland is a very important part of the seal chamber or the stuffing box. It gives the packings or the mechanical seal the desired fit on the shaft sleeve. It can be easily adjusted in axial direction. The gland comprises of the seal flush, quench, cooling, drain, and vent connection ports as per the standard codes like API 682.
o Throat Bushing: The bottom or inside end of the chamber is provided with a stationary device called throat bushing that forms a restrictive close clearance around the sleeve (or shaft) between the seal and the impeller. o Throttle bushing refers to a device that forms a restrictive close clearance around the sleeve (or shaft) at the outboard end of a mechanical seal gland. o Internal circulating device refers to device located in the seal chamber to circulate seal chamber fluid through a cooler or barrier/buffer fluid reservoir. Usually it is referred to as a pumping ring. o Mechanical Seal: The features of a mechanical seal will be discussed in Part-II of the article. 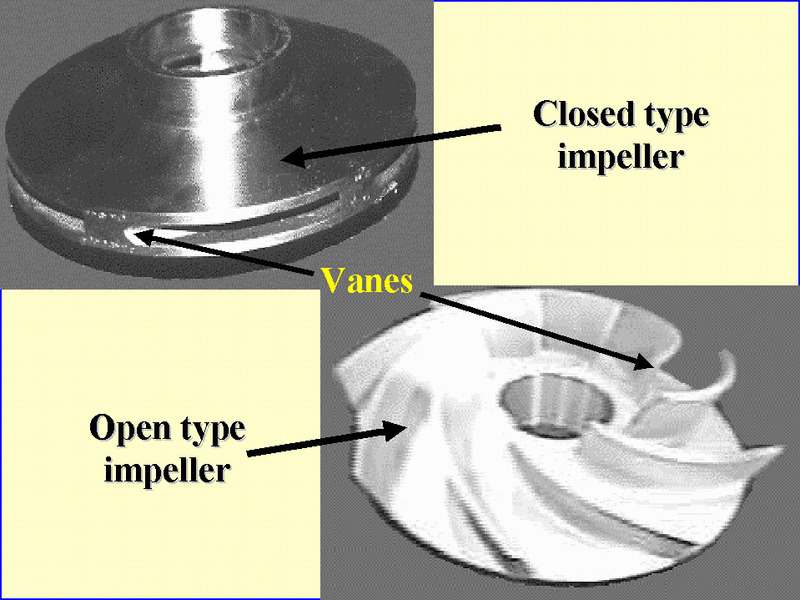 The impeller is the main rotating part that provides the centrifugal acceleration to the fluid. They are often classified in many ways. - Single-suction: Liquid inlet on one side. - Double-suction: Liquid inlet to the impeller symmetrically from both sides. - Closed: Shrouds or sidewall enclosing the vanes. - Open: No shrouds or wall to enclose the vanes. o Wear rings: Wear ring provides an easily and economically renewable leakage joint between the impeller and the casing. clearance becomes too large the pump efficiency will be lowered causing heat and vibration problems. Most manufacturers require that you disassemble the pump to check the wear ring clearance and replace the rings when this clearance doubles. 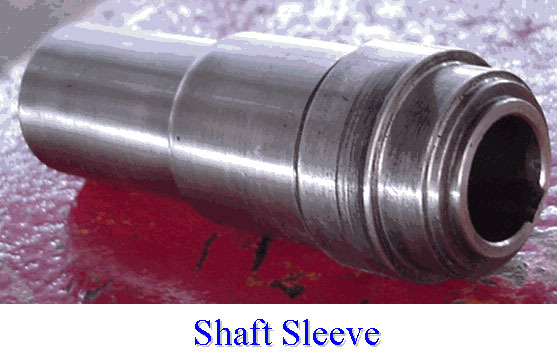 o Shaft Sleeve (Figure B.08): Pump shafts are usually protected from erosion, corrosion, and wear at the seal chambers, leakage joints, internal bearings, and in the waterways by renewable sleeves. Unless otherwise specified, a shaft sleeve of wear, corrosion, and erosionresistant material shall be provided to protect the shaft. The sleeve shall be sealed at one end. The shaft sleeve assembly shall extend beyond the outer face of the seal gland plate. (Leakage between the shaft and the sleeve should not be confused with leakage through the mechanical seal). - Elastomeric couplings use either rubber or polymer elements to achieve flexibility. These elements can either be in shear or in compression. Tire and rubber sleeve designs are elastomer in shear couplings; jaw and pin and bushing designs are elastomer in compression couplings. - Non-elastomeric couplings use metallic elements to obtain flexibility. These can be one of two types: lubricated or nonlubricated. Lubricated designs accommodate misalignment by the sliding action of their components, hence the need for lubrication. The non-lubricated designs accommodate misalignment through flexing. Gear, grid and chain couplings are examples of non-elastomeric, lubricated couplings. Disc and diaphragm couplings are non-elastomeric and nonlubricated.